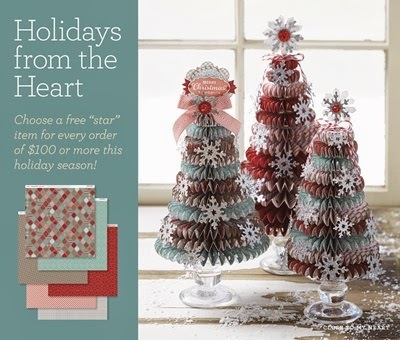 I think by now you've all noticed the trees on the cover of the Holidays from the Heart Gift Guide. They are so beautiful, and I've been wanting to make at least one for myself. My favorite piece of paper in the Sparkle and Shine packet is the silver houndstooth, so I decided to go with a silver tree. This paper is so shiny in itself that I wish I could have photographed that shine for you. Now let me tell you what I did so that you can make your own tree. You will need 5 sheets of paper and your Artiste cartridge to cut the yo-yos. You can actually choose any one of the several yo-yos on the cartridge, but my "go to" yo-yos are always two on page 55 of the handbook. They are accent 4 or 3-D object + shift. I used the one on the 3-D object key for this tree. You will have to cut two of each to make the yo-yo, so there is a total of 22 die-cuts. Punch twenty-two 1-1/4" circles. Once you've got the pieces accordion folded, form them into yo-yo by adhering two together with Liquid Glass. Put a dollop of Liquid Glass on one of the circles so that you have a solid base for your yo-yo. Then put Liquid Glass in the center of the yo-yo and add a circle to the top. You may have to hold it for a second or two, but this is going to be an extremely strong yo-yo! Stack all the yo-yos to create a tree. Simply use Liquid Glass to hold them together. When this was done, I added some Stardust glitz gel to the edges of each yo-yo. Again, I wish you could see how shiny my tree is! You'll need your Artiste cartridge again to cut the snowflakes. I used silver glitter paper (cuts beautifully in the Cricut! ), and cut the snowflake on page 79 of the handbook at 1-1/4". I have 18 snowflakes on my tree, and I adhered them with Liquid Glass. I went back and forth on what to use for the topper, but I love the bow on 55 of the handbook (Accent 2). I put two bows back to back on my own tree, so I couldn't imagine why it couldn't be done on this one. I cut two bows and ribbons at 1-1/4". Of course, I used Liquid Glass to put them on the tree, and then I searched my stash for some big bling buttons. The tree took about 3-1/2 hours to make. Because of materials and time, I think this is the only one I'll make this year, but it was a super fun project! I think all the glitteriness (yes, I did just make up that word!) will really be pretty in the shimmering lights that we put up for Christmas! Thanks for stopping in today, and I hope that you are having a most blessed Sunday! Gorgeous. That is a labor of love and a holiday decoration you will cherish year after year. Cute as can be! I love that houndstooth print! That extra sparkle at the top is gorgeous! Gorgeous! Love the all the glitteriness everywhere! This would make a wonderful gift for my Mom. Thanks for inspiring us once again.